WITH THIS TRIVIA CROSSWORD WORD SEARCH ACTIVITY PUZZLE BOOK, YOU CAN MAKE YOUR Mississippi State Bulldogs LOVER LIGHT UP WITH DELIGHT! This edition covers the Mississippi State Bulldogs Greatest Football Players. This combination book will keep your trivia, crossword and word search fans busy for years. Our Fill In crossword puzzles (also known as Fill-It-Ins or Word Fills) are different from the traditional crossword puzzle in that we supply you with the words, instead of clues and you need to complete the grid. We call these Mosaic Crosswords! Everybody loves a word search puzzle! Our word search puzzles are challenging for both adults and children hiding the words both front and backwards as well as diagonal. Our Trivia Fun Facts sheet lists the Mississippi State Bulldogs Greatest Players. These player are in order as voted on by you the fans! Ever wonder if your favorite player is on the all-time greatest Mississippi State Bulldogs list? Wonder no more as we have the answers for you! We are sure you&#x2019;ll see at least a few surprises! If you&#x2019;re looking for a gift, for any occasion, that your Mississippi State Bulldogs Lovers will actually use and enjoy for years to come, then check out the Mississippi State Bulldogs Trivia Crossword Word Search activity puzzle book! Customized Trivia Crossword Word Search activity puzzle books speak to their recipients on a more personal level, making them feel special. Plus, Trivia Crossword Word Search activity puzzle books are universally functional gifts, for both kids and adults. It is proven that Trivia Crossword Word Search puzzles are a great way to reduce stress and increase self-esteem all while keeping your small motor skills active. This new Trivia Crossword Word Search activity puzzle book will delight both existing fans and new puzzle enthusiasts as they discover this timeless and unique collection of entertainment. These puzzles are designed to keep you challenged and engaged, so sharpen your pencils and get ready! 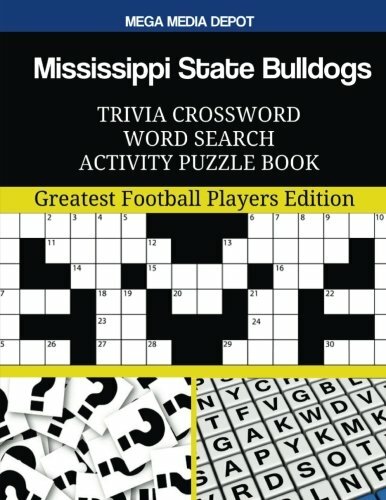 The Journal of the American Medical Association (JAMA) finds that cognitive puzzles such as Trivia Crossword Word Search puzzles &quot;can bolster the mind in the same way that physical exercise protects and strengthens the body.&quot; This edition contains the Mississippi State Bulldogs Greatest Players! This Unofficial Mississippi State Bulldogs Edition is no way affiliated with the Mississippi State Bulldogs . It is created by Mississippi State Bulldogs fans for Mississippi State Bulldogs fans. THE ONLY AUTHORIZED SELLER OF THIS Mississippi State Bulldogs TRIVIA CROSSWORD WORD SEARCH ACTIVITY PUZZLE BOOK IS MEGA MEDIA DEPOT. MEGA MEDIA DEPOT DELIVERS THE HIGHEST QUALITY Mississippi State Bulldogs TRIVIA CROSSWORD WORD SEARCH ACTIVITY PUZZLE BOOKS. Our Trivia Crossword Word Search activity puzzle books are printed and shipped in the United States. MEGA MEDIA DEPOT TRIVIA CROSSWORD WORD SEARCH ACTIVITY PUZZLE BOOKS ARE 8 &frac12; by 11 MAKING PUZZLE SOLVING EASY. REST ASSURED WITH OUR MONEY-BACK GUARANTEE. All Mega Media Depot products come with a 100% Customer Satisfaction Guarantee. IT&#x2019;S BOUND TO BECOME A FAVORITE Mississippi State Bulldogs GIFT. So what are you waiting for? Click the Add-to-cart button and get your Mississippi State Bulldogs Trivia Crossword Word Search Activity Puzzle Book while supplies last.